Look at that drizzle. Have you seen a better drizzle? If you've already scrolled down and read the ingredients for this recipe, I know what you're thinking: Goat cheese and fish...? Just trust me on this one. Please, for your taste buds' sake, trust me on this one. I created this recipe for a cooking demonstration I did at the fish market where I work (I usually make up the recipes in my head on friday evenings and then try them out for the first time during the saturday morning demos... I know, that sounds irresponsible, but- and I don't mean to brag- I have yet to make something that the attending customers and my coworkers didn't devour). Everyone loved the free sample version of this so made it for dinner later that week. When I cooked this for the demo I used mascarpone cheese, a soft and mild italian cheese often reserved for dessert recipes. It worked well but because it is so soft, it could only handle a small amount of liquid soy sauce before becoming too runny. At home I used goat cheese because we had a Costco-sized container that needed to be used up and was impressed with the results. I got to thin it out with more soy sauce which translated to more flavor and, unlike the mascarpone- which didn't add much of it's own flavor- the slight tartness of the goat cheese worked surprisingly well for this dish. 2 tsp wasabi paste- or more! Combine orange zest, sesame seeds and pepper. Spread out in a shallow dish. Lay mahi mahi filets, flesh side down in the sesame seed mixture. Press the seed mixture into the flesh of the filets but leave the skin uncoated. Heat coconut oil in a pan over medium heat. Place mahi mahi filets sesame seed side down in the pan. Cook on this side until seeds are toasted- about 3 minutes. Flip fish and cover pan. Cook for 8 minutes more or until fish is opaque throughout and about 140 degrees in the center. Meanwhile, whisk together goat cheese, soy sauce, almond milk and wasabi paste. Heat in a small saucepan being careful not to boil and stirring frequently. 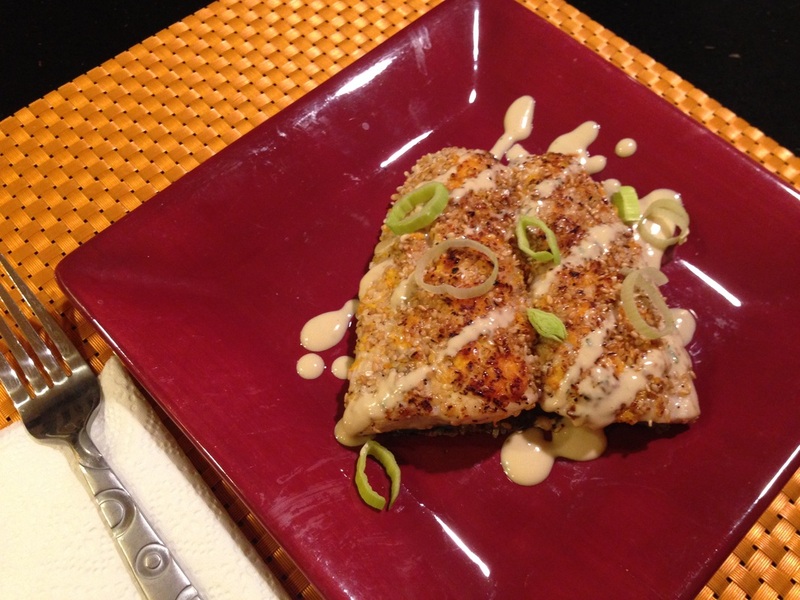 Serve mahi mahi filets with goat cheese sauce drizzled over top and finished with a garnish of scallions.